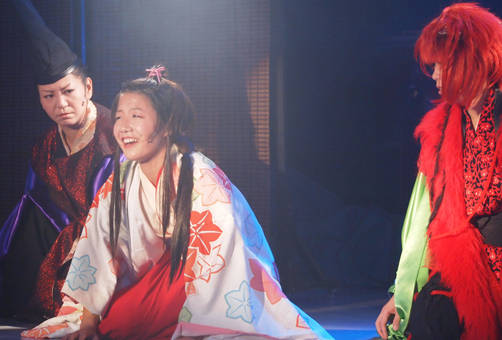 Roko, Saki, and Hiro in The Legend of Oni. Photo by Mai KIsaka. BOTTOM LINE: If a little rough around the edges, this is a unique experience and a heartbreaking story that will entice and challenge the determined viewer. The Legend of Oni takes the audience back to the Heian period in Japanese history, before the rise of the Samurai. There were constant squabbles taking place between the various nobles of society, all vying for greater power and wealth, and willing to go to great lengths to thwart their competition. We follow the story of the the noble Nagamichi and his son Ebuki, who we learn are both transforming into Oni when the show begins, due to their corrupt hearts and practices. Oni are hateful ogres of Japanese myth who represent great rage and are known to come down from the mountains to punish humans who share their sins. However, Nagamichi is only changing on the inside, while Ebuki is growing horns and bright red hair. Over the course of this musical tale, the ensemble aims to teach the audience that we all have the potential to become Oni, and we must always strive to let cooler heads prevail over anger and jealousy. The first thing an audience member will probably notice is the large TV screen: The Legend of Oni is performed entirely in its original Japanese, with English subtitles (translated by Hiromi Zeppieri). Unfortunately, between somewhat regular spelling and grammar errors, as well as a number of phrases and ideas that seem not to translate well, this intended aid can sometimes be difficult to follow, especially when there are more than a few actors onstage. I found myself having to consistently attempt to further interpret what I was reading on screen. All that said, crossing this language barrier is a huge feat; while certain lines of dialogue were ultimately lost on me, I didn't have any trouble following the story as a whole. The all-female cast, while not the most polished vocalists, are incredibly energetic and expressive. Indeed, I sometimes abandoned the subtitles entirely because, even if I missed a detail here and there, it became clear that the acting would communicate whatever I needed to know. The storytelling is aided by an incredibly driving score composed by playwright/director Naoko Tsujii. The music is upbeat and firmly rooted in the Japanese styles that the whole production oozes from its pores. My only complaint here is that the notes in the music sometimes drop so low that the women cannot sing them loud enough to be heard, even as close as the front row. The greatest strength of The Legend of Oni is the choreography. The rare moments when more than two or three people are onstage at a time, weaving around each other, playing instruments, and dancing with one another, are a pleasure to watch—we get to see the traditional movement styles of the world of the play activated in full force. I only wish that greater advantage had been taken of the vocal and physical power achieved when everyone in the large cast works together. All in all I enjoyed The Legend of Oni, if only because it is so different in so many ways from the typical theatre offerings in New York. It forced me to adjust how I watched it as I watched it, because, given that this production is a transfer from Japan, many of the storytelling conventions are vastly different from those familiar to US-audiences. For those looking for something fun and easy to digest, this is probably not the best production to see. But for those who like being challenged, there is a lot to appreciate and grapple with in The Legend of Oni. The Legend of Oni is written, composed, choreographed, and directed by Naoko Tsujii. English Translation by Hiromi Zeppieri. Music arranged by Tomoko Otsuki. Set Design is by Hitoshi and Yumiko Fujii. Lighting Design is by Marie Yokoyama. Stage Manager is Futoshi Miyai. The cast is Roko Hidayama, Hiro Matsumoto, Saki, Kaho, Toko Higushi, Hinata Aoi, Mai Kisaka, Azuki, Kanae Kiuchi, Chihiro Sakae, Yan, Ayaka, and Asami Mino.